Freezing rain mixed with sleet, locally heavy at times, with embedded elevated convection will continue through the overnight into the morning hours across Arkansas and will produce around 1.00-1.25″ of liquid equivalent precipitation. 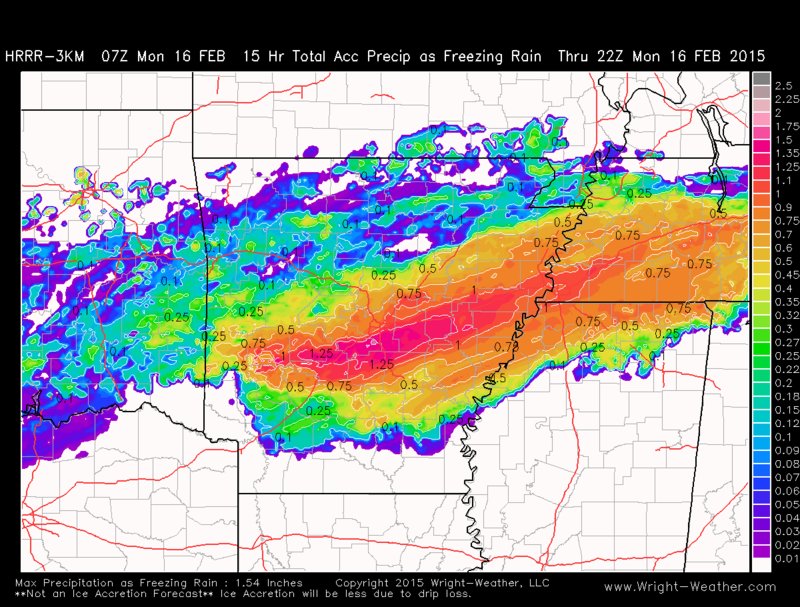 Much of this will fall in the form of freezing rain across Central Arkansas into Western Tennessee. Ice accretion of 3/8″ to as much 5/8″ of an inch are likely before the precipitation finally ends around noon local time. [18Z]. Ice accretion amounts of 1/2″-5/8″ will bring down large branches and some trees. These can fall on power-lines and disrupt electrical service. They can also fall on pedestrians and cars. Ice accretion of this amount can cause widespread disruption of power in urban areas and create life threatening hazards with extended loss of power and falling large limbs/trees. The area in and around Little Rock, AR is at risk of widespread power outages if the forecast trends continue and ice accretion amounts exceeds 1/2″ later today. Below.. the total precipitation that will fall as freezing rain as depicted by the HRRR through 22Z. Actual ice accretion will be less due to drip loss. Click for the latest Little Rock, AR Regional Winter Radar. Updated Every 5 Mins.